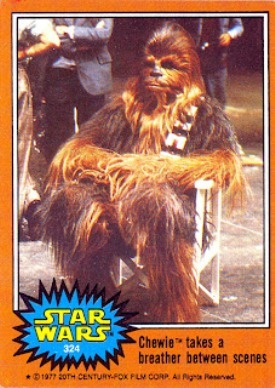 1978 Topps Star Wars Series 5 marked the end of the initial run of trading cards for the blockbuster franchise. Really, though, it was just the beginning. After several decades, Topps is still producing sets and collectors are still scooping them up. What's interesting about this set is that several cards go behind the scenes. While this may not make for the most action-packed or visualy pleasing trading cards, for movie fans, they're fascinating. Star Wars used a ton of groundbreaking effects. DVDs weren't around back then to regularly pull the curtain back. 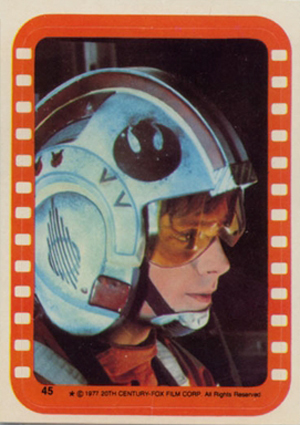 The 1978 Topps Star Wars Series 5 base cards run from numbers 265 to 330. They keep the same design as the previous four series, only this time with an orange border. Stickers also continue. Falling one per pack, they are numbered 45 to 55. They also have an orange border for the film strip. 267 No-Nonsense Privateer Han Solo! 269 Droids on the Run! 270 Luke: Farmboy Turned Warrior! 271 "Do You Think They'll Melt Us Down, Artoo?" 273 "This is All Your Fault Artoo!" 274 Droids Trick the Stormtroopers! 276 It's Not Wise to Upset a Wookiee! 280 "Remember Luke, the Force Will Be With You"
282 "Hurry Up, Luke We're Gonna Have Company!" 287 Han and Chewie Ready for Action! 289 The Rebel Fighters Take Off! 290 Chewie Aims for Danger! 293 A Friendly Chat Among Alien Friends! 296 Artoo-Detoo is Abducted by Jawas! 299 Leia Wishes Luke Good Luck! 300 Luke, the Star Warrior! 305 Director George Lucas and "Greedo"
307 A Touch-Up for Chewbacca! 321 George Lucas Directs his Counterpart "Luke"
325 The Princess Gets the Brush! 55 A Touch-up For Chewbacca! I have just one cardboard card. Is any one interested in this one card? I have found the Orange series has an abundant amount of cards that are cut 1/8 of an inch short. Was this something common? I have a huge collection of 1977 duplicates and as I was going through the Orange I found some cards (specific numbers) were cut short, but not all numbers. 1977 STAR WARS Topps card set series 1 2 3 4 5 !! Beautiful !! No stickers.